Tales From The Eye: YARGH!!! Most uncool. 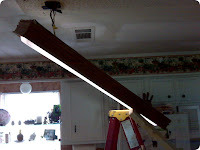 The light in the kitchen decided to come completely detached from the ceiling. Fortunately. it dropped off the anchors without slamming into one of the kids. Unfortunately the sudden descent broke the tubes. Aside from being dangerous, it was also rendered into a useless, dangling corpse. So I just snipped the only wires that kept it suspended from in mid-air and we threw the bones in the garage. With my keen, CSI-like skills, I eventually determined that the former owners had not screwed the anchors into any studs. Instead, they attached it to the bare drywall. And after a couple of years, it wiggled lose. I'm surprised it lasted this long. Just one more project added to my list.